Maha Shivaratri(the Great Night of Shiva) is celebrated to honor the Shiva Tattva (Divine Consciousness). According to Shiva when asked one thing that pleases HIM the most, HE replied, “ the 4th night of the new moon, is MY favorite day”. 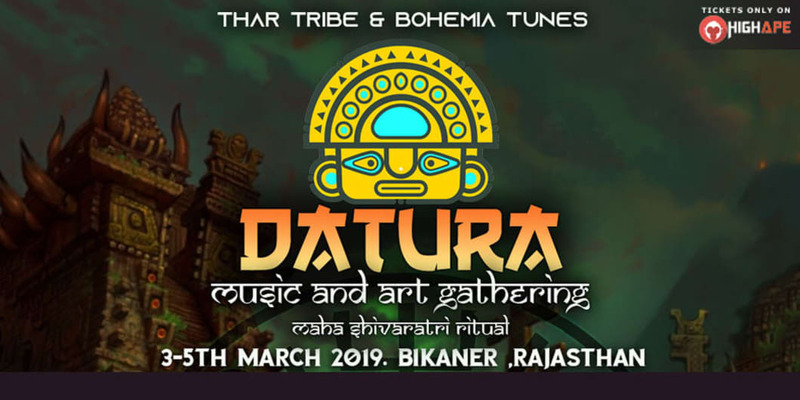 We here announce you the expansion of datura..
Once again we meet under the open skies filled with millions of mesmerizing stars and dance together , to the start of a new moon cycle! To gain more power! Once again in the colorful deserts of bikaner! Memories will be made! Experiences will be shared, and of course a real banger line up to make u experience a night full of some of the best sounds of psytrance! OTHER CHILL OUT ACTVITIES !!!! Location will be revealed only to ticket holders ! See you guys on the dance floor!! Let’s share some good vibes together and spread love n light! Don’t miss this one !! 4. Rights of the admission are reserved with the organisers. 5. Please carry a valid ID proof issued by govt of india. 6. don't carry any weapons or any other illegal things. 7. Checking on gates upon request. 8. This is a non refundable ticket. 9. Event time may change depending upon state authorities or weather conditions. 11. Please do not carry any NDPS substance into the venue or consume since this is a drug free event. 12. In conformance to the environment safety standards we request the minimum use of plastic and other non degradable materials in or around the venue. 13. Please carry adequate cash with yourself as per your requirement since ATM Dispensers are very far from the venue. Discover Awesome Nightlife Events, Activities & Places in Bikaner.